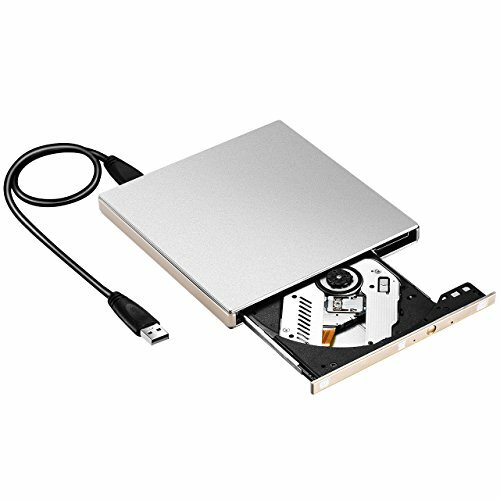 This USB 3.0 optical CD/DVD burner super drive is tray loading external portable ODD caddy which is suitable to USB 2.0/3.0 connector desktop or laptop. This super slim drive provides you faster data transfer speed. It is a perfect companion for computers without an internal drive. This ultra slim CD/DVD burner adopted 3.0 USB technology. It provides faster data transfer speed than the previous 2.0 USB and 1.0 USB. And this updated drive is compatible with 2.0 USB and 1.0 USB. The two anti-skipping rubber mats on the bottom provide complete stability. They protect the external CD/DVD drive from skipping and dropping off the desk. Powered by one 3.0 USB cable, no external power or driver is needed. Just plug and play. With the Reject Design, never worry about that the disc will get stuck in the drive. This external hard drive features ultra slim, portable, lightweight and compact, so you can take it along with you while travelling. It is convenient to put the super slim optical drive into your bag. 1.Internal laser light can be harmful to the eyes and face, please don?¡¥t open. 2.Do not keep the optical drive nearby strong magnetic objects. 3.Please place the optical drive stable on the desktop, and do not put it on the unstable objects. 4.Please hook up the drive to the USB port on your computer directly. If you connect it to a USB hub or extension cord, it may not recognize the driver or read the CD/DVD. Support System: Windows 2000/2003/XP, Windows 7/8/10, Vista7/8 and all versions of MAC OS systems. USB3.0 Interface: USB3.0 transmission standard (the USB cable is included), backward compatible with USB2.0, and the data transmission speed is faster and more stable than before, it reaches up to a maximum of 5Gbps. Wide Compatibility: Well compatible with Windows/2003/Wind8.1/Wind10/Vista/7, Linux, Mac 10 OS system. This CD/DVD-RW Drive supports read CD, VCD, SVCD, CD-R, CD-RW, DVD-R/DVD-RW and burn CD-RW, CD+RW, DVD-RW, DVD+RW etc. Support Plug and Play: No need to install the driver program, this optical drive supports plug and play. Moreover, this external drive features strong error-correcting ability, anti-shock and noise reduction technology, low-power consumption. Powered by the USB port, no external AC adapter needed. No complicated installation, easy to use. Classic Appearance: With the smooth, shining surface, this ultra slim portable CD/DVD player looks fashionable. And this portable CD/DVD player features ultra slim, lightweight and portable. With the pop up bottom, never worry about the disc will get stuck inside. Pure Copper Mesh Technology: The data cable adopted the design of embedding into product, the impedance of pure copper mesh technology is low, shield is strong, and data transmission is more stable. This portable USB3.0 interface drive enjoys 45 days money-back and 12-month warranty.